On 23 December 1924, a group of leading international businessmen gathered in Geneva for a meeting that would alter the world for decades to come. Present were top representatives from all the major lightbulb manufacturers, including Germany’s Osram, the Netherlands’ Philips, France’s Compagnie des Lampes, and the United States’ General Electric. As revelers hung Christmas lights elsewhere in the city, the group founded the Phoebus cartel, a supervisory body that would carve up the worldwide incandescent lightbulb market, with each national and regional zone assigned its own manufacturers and production quotas. It was the first cartel in history to enjoy a truly global reach. The Phoebus cartel enjoyed a truly global reach. The U.S. company General electric was itself not a member but was represented through its overseas subsidiaries. The cartel’s grip on the lightbulb market lasted only into the 1930s. Its far more enduring legacy was to engineer a shorter life span for the incandescent lightbulb. By early 1925, this became codified at 1,000 hours for a pear-shaped household bulb, a marked reduction from the 1,500 to 2,000 hours that had previously been common. Cartel members rationalized this approach as a trade-off: Their lightbulbs were of a higher quality, more efficient, and brighter burning than other bulbs. They also cost a lot more. Indeed, all evidence points to the cartel’s being motivated by profits and increased sales, not by what was best for the consumer. In carefully crafting a lightbulb with a relatively short life span, the cartel thus hatched the industrial strategy now known as planned obsolescence. Today, with many countries phasing out incandescent lighting in favor of more-efficient and pricier LEDs, it’s worth revisiting this history—not simply as a quirky anecdote from the annals of technology but as a cautionary tale about the strange and unexpected pitfalls that can arise when a new technology vanquishes an old one. It wasn’t easy being a lightbulb maker in the early 20th century. The rapid spread of electrification and the introduction of new forms of lighting like bicycle lamps, car headlights, and streetlights did offer nearly limitless opportunities for inventors and entrepreneurs. But as thousands of manufacturers vied for market share and a technological edge, no single company felt assured of stable sales from one year to the next. That was as true for tiny backroom operations as it was for the giant corporate entities with multinational factories and research laboratories. Immediately preceding the cartel’s formation, for instance, Osram experienced a dizzying drop in its German sales, from 63 million lightbulbs in the financial year 1922–23 to 28 million the following year. Not surprisingly, Osram head William Meinhardt was the first to propose the arrangement that eventually became the Phoebus cartel. Alliances among lightbulb makers were not exactly new. The Verkaufsstelle Vereinigter Glühlampenfabriken, for instance, was a European cartel of carbon-filament lamp manufacturers that formed in 1903 to stabilize industry ties. It was rendered superfluous when in 1906 two European companies introduced a superior lightbulb whose filament was made from tungsten paste. That bulb was itself eclipsed in 1911 by General Electric’s metal-filament bulb, which used pure drawn tungsten wire, and in 1913 by GE’s gas-filled tungsten bulb. Dubbed the half-watt bulb, the latter was infused with argon or some other noble gas, which preserved the tungsten better than a simple vacuum; it produced five times as much light per watt as its carbon-filament predecessor. GE’s licensing of its basic lightbulb patents gave rise to yet more alliances, most notably the powerful Patentgemeinschaft (“patent pool”), which controlled the GE patent rights in much of Europe up until World War I. Any company seeking to license GE’s intellectual property had to abide by a strict production quota. Philips, for example, was given an annual quota of 5.7 million lightbulbs, despite the fact that its Eindhoven facility could easily produce twice that amount. The Berlin-based patent pool fell apart with the geopolitical reshuffling during the war. As soon as hostilities ended and the lightbulb business once again surged, a new cartel, the Internationale Glühlampen Preisvereinigung, sprang up to try to control prices for much of continental Europe. None of these efforts, though, had quite the reach and ambition of the Phoebus cartel. On paper, it sounded entirely benign. The document that companies signed to join it was called the “Convention for the Development and Progress of the International Incandescent Electric Lamp Industry.” According to that document, the organization’s chief goals were “securing the cooperation of all parties to the agreement, ensuring the advantageous exploitation of their manufacturing capabilities in the production of lamps, ensuring and maintaining a uniformly high quality, increasing the effectiveness of electric lighting and increasing light use to the advantage of the consumer.” It covered all electric lightbulbs used for illumination, heating, and medical purposes. In addition to the companies mentioned earlier, its members included Hungary’s Tungsram, the United Kingdom’s Associated Electrical Industries, and Japan’s Tokyo Electric. The U.S. company GE, one of the prime movers behind the group’s formation, was itself not a member. Instead it was represented by its British subsidiary, International General Electric, and by the Overseas Group, which consisted of its subsidiaries in Brazil, China, and Mexico. Over the next decade or so, GE would acquire significant stakes in all the member companies that it did not already own. Light Bright: One of the key achievements of the global lightbulb alliance known as the Phoebus cartel was to engineer shorter-lived lamps. Samples were regularly checked to ensure they conformed to cartel standards; this photo shows a testing facility owned by cartel member Philips, of the Netherlands. To oversee national lightbulb markets and their respective development in global trade, Phoebus established a supervisory body, chaired by Meinhardt of Osram. The cartel’s other main activities were to facilitate the exchange of patents and technical know-how and to impose far-reaching and long-lived standards. To this day, we still use the screw-type socket—devised by Thomas Edison back in 1880 and designated E26/E27—thanks to the cartel. Most significantly for consumers, Phoebus expended considerable technical effort into engineering a shorter-lived lightbulb. How exactly did the cartel pull off this engineering feat? It wasn’t just a matter of making an inferior or sloppy product; anybody could have done that. But to create one that reliably failed after an agreed-upon 1,000 hours took some doing over a number of years. The household lightbulb in 1924 was already technologically sophisticated: The light yield was considerable; the burning time was easily 2,500 hours or more. By striving for something less, the cartel would systematically reverse decades of progress. The details of this effort have been very slow to emerge. Some facts came to light in the 1940s, when the U.S. government investigated GE and a number of its business partners for anticompetitive practices. Others were uncovered more recently, when I and the German journalist Helmut Höge delved into the corporate archives of Osram in Berlin. Jointly founded in 1920 by three German companies, Osram remains one of the world’s leading makers of all kinds of lighting, including state-of-the-art LEDs. In the archives, we found meticulous correspondence between the cartel’s factories and laboratories, which were researching how to modify the filament and other measures to shorten the life span of their bulbs. The cartel took its business of shortening the lifetime of bulbs every bit as seriously as earlier researchers had approached their job of lengthening it. Each factory bound by the cartel agreement—and there were hundreds, including GE’s numerous licensees throughout the world—had to regularly send samples of its bulbs to a central testing laboratory in Switzerland. There, the bulbs were thoroughly vetted against cartel standards. If any factory submitted bulbs lasting longer or shorter than the regulated life span for its type, the factory was obliged to pay a fine. Companies were also fined for exceeding their sales quotas, which were constantly being adjusted. In 1927, for example, Tokyo Electric noted in a memo to the cartel that after shortening the lives of its vacuum and gas-filled lightbulbs, sales had jumped fivefold. “But if the increase in our business resulting from such endeavors directly mean[s] a heavy penalty, it must be a thing out of reason and shall quite discourage us,” the memo stated. Work in Progress: Germany’s Osram pushed for the formation of the Phoebus cartel in part to shelter it from the volatility of the incandescent lighting market. Shown here is one of the company’s lightbulb factories. As this episode reveals, tweaking a lightbulb’s rated voltage was one way to modify the product’s life. 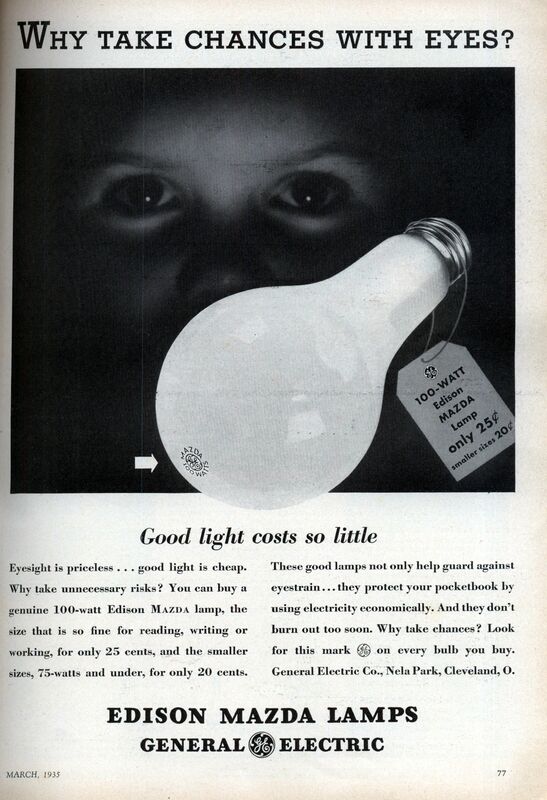 Another was to adjust the current, as GE engineers did to decrease the life span of its flashlight bulbs. A GE flashlight bulb in the precartel days was designed to last longer than three changes of batteries. This life span was then cut to two battery changes, and in 1932 the GE engineering department proposed that the bulb last no longer than one battery. A GE engineer named Prideaux wrote in a memo, “We would suggest increasing Mazda lamp No. 10 from .27 ampere to .30; and 13.14 and 31 from .30 to .35. This would result in increases of candlepower of 11 and 16 percent respectively.” That boost in illumination, he suggested, “would be acceptable to all flashlight users” despite the fact that the higher current would shorten not just the bulb’s life but also the battery’s. The cartel’s justification for these changes was that at the higher current levels, the bulbs produced more lumens per watt. Alas, more current means not only more brightness but also higher filament temperature and therefore shorter life. Indeed, much of the cartel’s life-limiting research focused on the filament, including its material, its shape, and the evenness of its dimensions. Over the course of nearly a decade, the cartel succeeded in this quest. The average life of a standard reference lightbulb produced in dozens of Phoebus members’ factories dropped by a third between 1926 and fiscal year 1933–34, from 1,800 hours to just 1,205 hours. At that point, no factory was producing bulbs lasting more than 1,500 hours. Out, Out, Brief Bulb: Prior to the Phoebus cartel’s formation in 1924, household bulbs typically burned for a total of 1,500 to 2,500 hours; cartel members agreed to shorten that life span to a standard 1,000 hours. Each factory regularly sent lightbulb samples to the cartel’s central laboratory in Switzerland for verification. This graph, obtained from the Municipal Archive of Berlin, shows how life spans generally declined over time, from an average of 1,800 hours in 1926 to 1,205 hours in fiscal year 1933–34. Of course, given the collective ingenuity of the cartel’s engineers and scientists, it should have been possible to design a lightbulb that was both bright and long-lived. But such a product would have interfered with members’ desire to sell more bulbs. And sell more bulbs they did, at least initially. In fiscal year 1926–27, for instance, the cartel sold 335.7 million lightbulbs worldwide; four years later, sales had climbed to 420.8 million. What’s more, despite the fact that the actual costs of manufacturing were dropping, the cartel maintained more or less stable prices and therefore higher profit margins. From its inception until the end of 1930, the cartel retained its overwhelming share of a growing market. But the good times would not last. As the cartel continued its policy of artificially elevated prices, competitors spotted a golden opportunity to sell cheaper, if often inferior-quality, goods. Particularly threatening was the flood of inexpensive bulbs from Japan. Although Tokyo Electric was a cartel member, it had no control over the hundreds of smaller, family-owned workshops that produced bulbs almost entirely by hand. Japanese consumers apparently preferred the higher-quality products sold by the larger manufacturers, and so the majority of these cheap, handmade bulbs were exported to the United States, Europe, and elsewhere, where they sold for a fraction of the price of a Phoebus bulb and well below the average production cost of a cartel bulb, too. From 1922 to 1933, Japan’s annual output of incandescent bulbs grew from 45 million to 300 million. However, as Philips historian I.J. Blanken has noted, these cheap bulbs weren’t necessarily a bargain. “Owing to its greater current consumption, the true cost of using one of the poor-quality Japanese lamps, measured over the life of the lamp, was many times greater” than whatever the consumer had saved by buying a cheap lamp rather than a Philips one. Powerful and influential though it was, the Phoebus cartel was short-lived. Within six years of its formation, the cartel was already starting to struggle. Between 1930 and 1933, its sales volume dropped by more than 20 percent—even as the overall market for lighting was growing. The cartel was also weakened by the expiration of GE’s basic lightbulb patents in 1929, 1930, and 1933, by occasional conflicts among its members, and by legal attacks, particularly in the United States. What ultimately killed Phoebus, however, was World War II. As the members’ host countries went to war, close coordination became impossible. The cartel’s 1924 agreement, which was supposed to last until 1955, was nullified in 1940. Shine On: A shop window display for Philips lightbulbs speaks to the spread of electrification and artificial illumination in the early 20th century. Though long gone, the Phoebus cartel still casts a shadow today. That’s true in part because the lighting industry is now going through its most tumultuous period of technological change since the invention of the incandescent bulb. After more than a century of dominance, these bulbs are now being phased out in favor of compact fluorescent and especially LED bulbs. Consumers are expected to pay more money for bulbs that are up to 10 times as efficient and that are touted to last a fantastically long time—up to 50,000 hours in the case of LED lights. In normal usage, these lamps will last so long that their owners will probably sell the house they’re in before having to change the bulbs. Whether or not these pricier bulbs will actually last that long is still an open question, and not one that the average consumer is likely to investigate. There are already reports of CFLs and LED lamps burning out long before their rated lifetimes were reached. Such incidents may well have resulted from nothing more sinister than careless manufacturing. But there is no denying that these far more technologically sophisticated products offer tempting opportunities for the inclusion of purposefully engineered life-shortening defects. After all, few people will complain, or even notice, if a bulb burns out 9 years after it is installed rather than 14. True, today’s lighting industry is much larger and more diverse than it was in the 1920s and ’30s, and government monitoring of collusive behavior is more vigilant. Nevertheless, the allure for businesses to cooperate in such a market is strong. And the Phoebus cartel shows how it could succeed. Markus Krajewski is a professor of media studies at the University of Basel, in Switzerland. For a detailed look at the incandescent lightbulb industry in the early 20th century, see Volume 3 of I.J. Blanken’s The History of Philips Electronics N.V. (European Library, 1999). George W. Stocking and Myron W. Watkins’s classic 1946 text Cartels in Action: Case Studies in International Business Diplomacy (Twentieth Century Fund, 1946) has an excellent account of the cartel’s organization and activities, with particular emphasis on the role of General Electric. That book draws heavily from documents related to the U.S. government’s antitrust investigations of GE and its affiliates; see, for example, United States v. General Electric Co. et al., 1949. GE is also the focus of Leonard S. Reich’s “General Electric and the World Cartelization of Electric Lamps,” in International Cartels in Business History: The International Conference on Business History 18 (University of Tokyo Press, 1992), edited by Akira Kudō and Terushi Hara. In 2006, to celebrate its 100th anniversary, the German lighting company Osram issued a corporate history entitled “100 Years of Osram—Light Has a Name” [pdf]. The report discusses the Phoebus cartel only briefly and in an entirely benign fashion. For a longer if equally uncritical account of the cartel’s activities, see Osram chairman William Meinhardt’s Entwicklung und Aufbau der Glühlampenindustrie (Carl Heymanns Verlag, 1932). The 2010 documentary The Light Bulb Conspiracy explores the Phoebus cartel as an early example of planned obsolescence and includes interviews with Markus Krajewski. For more on the cartel and planned obsolescence, see the author’s “Fehler-Planungen. Zur Geschichte und Theorie der industriellen Obsoleszenz,” in Technikgeschichte, vol. 81, No. 1, p. 91–114, 2014, and “Vom Krieg des Lichtes zur Geschichte von Glühlampenkartellen,” in Das Glühbirnenbuch, edited by Peter Berz, Helmut Höge, and Krajewski (Braumüller Verlag, 2011). Both publications are in German. Fin Stewart’s History of the Electric Lamp (self-published, 2013) covers the lightbulb from pre-Edison times to the present and includes hundreds of photos of vintage lamps. It’s available for purchase as an e-book from the author; e-mail ferrowatte38@bigpond.com.